I feel bad for doing some lazy reviews lately, but it’s pretty late and I’m pretty tired, and I’ve already expressed my love for this marvelous movie. Davis is going for broke here, going as zany as she can, crafting an unforgettable performance. It’s so delightful, camp and self-aware yet not suffering the least for it. She gives some hilarious deliveries. 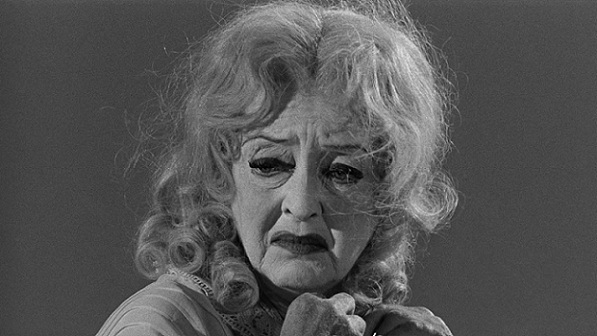 Crawford is no slouch either, of course, but how can you not be upstaged by Baby Jane Hudson? I also love Victor Buono in this, a fine and funny character actor. I need to track down more of his stuff, and I think I’ll start with The Strangler. This entry was posted on October 21, 2012 at 1:32 am	and is filed under Movie Reviews. You can follow any responses to this entry through the RSS 2.0 feed. You can leave a response, or trackback from your own site.